Skin cysts on dogs are sacs that are lined with secretory cells and which are found on the skin. Once the sacs form, there is a buildup of fluid resulting in swollen bumps on the skin. While some of the cysts will retain the fluids, others will dry out and thus the cyst will end up with firm material inside. Find out the various types of cysts on dogs including sebaceous and follicular cysts, how to drain them as well as the procedure used to clean a burst cyst. According to dog-health-guide.org, “Canine skin cysts are an abnormal closed epithelium (cellular covering)-lined cavity in the body, containing liquid or semisolid material.” The size will vary but they are mostly small. The cysts can be felt within the skin upon touch and are usually painless. 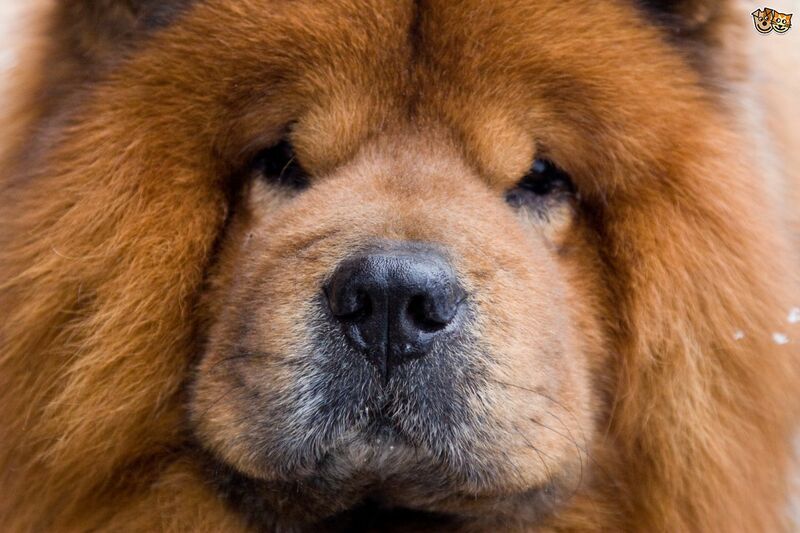 Cysts on dogs could appear anywhere. They are common on the dogs head, belly, legs chest, eyes and even tail. Not all cysts are the same and it is possible to confuse some other skin bumps on dogs with cysts. This makes it important to learn how to tell apart various bumps on dogs. Below are the types of canine cysts that can be found on a dog’s skin. These have a membrane lining the inner surface which produces secretions. The membrane is known as a secretory lining. These mostly form as a result of blocked ducts and are common in glands. An example of a true cyst is one forming in the sweat glands. To prevent recurrence, destruction or removal of the lining is necessary. These are fluid-filled sacs but which do not have the secretory lining found in true cysts. They are as a result of tissue death which may result from trauma or hemorrhage. The fluid found in such cysts develops when the surrounding dead tissues liquefy. In addition to the above two main classifications, specific types of cysts in dogs are discussed below. Also referred to as epidermoid cysts, these occur as a result of dilated hair follicles. They contain dark colored fluid which could be yellow or grey and are mostly a result of secondary infections. Follicular cysts usually appear as hard tissue nodules that are round in shape. They may be on the skin or beneath it and are most common on the head, neck or trunk. Interdigital follicular cysts in dogs are quite common. 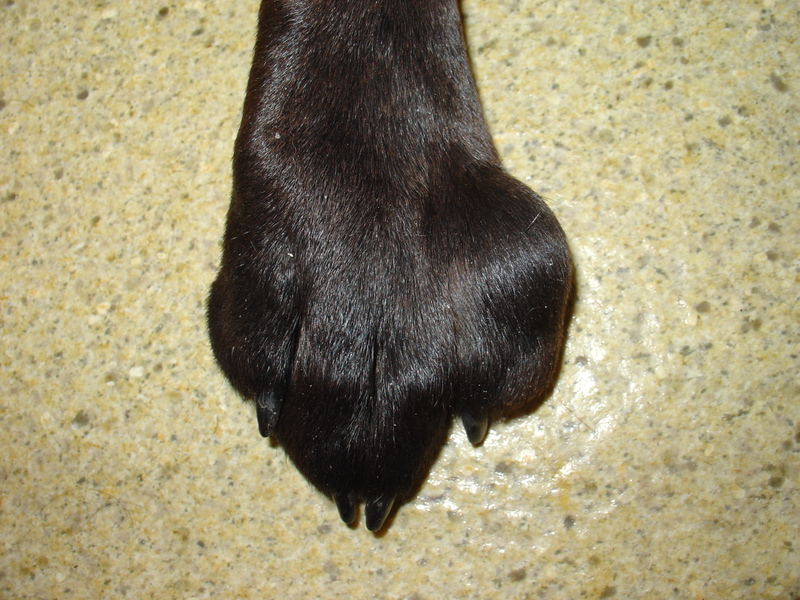 They usually form as a result of excessive friction or trauma on the webbing making up the paw. This could be as a result of congenital or acquired anatomic deformities. The resulting abnormal friction creates changes in the inter-digital skin resulting in the follicular openings getting clogged. As keratin production continues within the plugged follicle, it results in follicular dilation and formation of follicular cysts. The fact that dogs have compound hair follicles which means they have multiple hair shafts originating from a single opening also makes a formation of cysts on this part of the leg common. 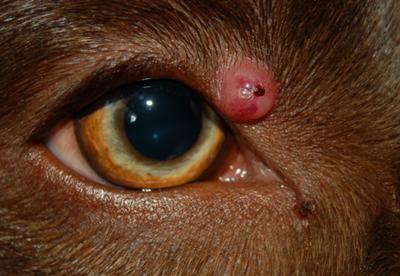 The term sebaceous cyst is commonly used to refer to either epidermoid or pillar cysts on dogs. However, these two cysts contain keratin as opposed to sebum which is what makes up sebaceous cysts. They also do not originate from the sebaceous glands. Epidermoid cysts on dogs originate from the epidermis while pillar cysts are from hair follicles. They are, therefore, not true sebaceous cysts. Epidermoid cyst occurs when the cyst sac contains cells found on the topmost layer of the skin otherwise known as the epidermis. On the other hand, pillar cysts occur when the cyst sac contains cells that are similar to those found at the point of the follicle where hair grows from. True sebaceous cysts form from the sebaceous glands and contain sebum. They are caused by blocked sebaceous glands, high levels of testosterone as well as swollen hair follicles. The term sebaceous cyst should thus not be used to refer to the two as it could be confusing. 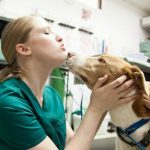 Dailypuppy.com claims that sebaceous cysts “are similar to acne” and that they “are essentially overgrown pimples”. They occur when hair follicles get clogged with debris, dirt, infectious material, and oil. The coarse and tight nature of breeds such as poodles, Yorkshire terriers, Spaniels, and Schnauzers makes them vulnerable to the formation of sebaceous cysts. They will remain as lumps beneath the skin without growing or disappearing. In cases where treatment is necessary, it may be necessary for the dog to undergo open drainage. This is an invasive procedure which should be carried by your vet. Below is the procedure on how it is done. The dog is placed under general anesthesia in readiness for the procedure. If necessary clippers may be used to shave the area around the area. Using a scalpel, the veterinarian cuts through the adjacent tissues to get to the cyst. Upon reaching the cyst it is cut open and either allowed to drain itself into a pan or the contents removed using suction. In case of infections, the vet will remove the cyst entirely before using sutures to close up the incision. Right after a dog’s cysts removal, the results can be seen immediately. The symptoms associated with it such as swelling should start fading away. Antibiotics may be issued in case the cyst was infected. When dealing with cysts on dogs, it is important to not pop them up. This is because opening up the cyst subjects your dog to infection-causing organisms. These could lead to secondary infections on the skin. In case you feel like the cyst is inhibiting your dog’s daily activities, talk to your vet about it so you can organize for drainage. If necessary, trim the area around the cyst to gain access and allow for direct contact with the cyst. Trimming will also prevent the discharge from crusting on the fur. Using a damp but warm washcloth, clean up the area. Start by applying it as a warm compress until the wash cloth loses heat. This will help to drain the cyst further as well as soften any crusting that may have formed from the contents of the cyst for ease of removal. Follow this up by disinfecting the area. You can use betadine or hydrogen peroxide. Repeat this procedure until the area gets healed. Keep monitoring the skin around the burst dog cyst as ruptured or burst cysts are vulnerable to infections. Inflammation and itch are also quite likely to occur. They should, therefore, be closely monitored and kept clean. Also look out for swelling, redness and smelly discharge as these are signs of infection. If observed, call in your veterinarian. In most cases, dog cyst burst with blood will be due to trauma. This can happen if the dog chews on the cyst or if they get hit on their point of existence. The contents that spill over will vary in consistency, appearance, and color. Where the burst cyst starts oozing, and blood is seen, watch the area keenly. In case this later scabs and the area does not continue to actively bleed and the dog exhibits no pain as well, you can keep cleaning and disinfecting the wound as illustrated above. Keep observing the area for any signs of infection too. However, where the bleeding continues over a while and your pooch is in pain, it is important to see your vet. Canine cysts occurring on the dogs’ head, skin, belly and other parts are normally not a threat as they are mostly benign. However, there are malignant tumors that could resemble them. While the details above cover various aspects on dealing with cysts on dogs, it is important to note that any bump that exhibits the characteristics listed below should be investigated by your veterinarian. These are signs that the bump may be malignant. Your vet will examine the cyst and advise on necessary treatment. In addition, talk to your vet for clarification on any other issues related to cysts on dogs that are of concern to you. My dog did the same thing. Is there any way you can treat a cyst on it own or anything that I can use to help get rid of it?? It’s on his eye so it is at a sentive place.